Manchester, N.H. - Vladimir Guerrero Jr., the highest rated prospect in Minor League Baseball, has been named Eastern League Player of the Month. The star third baseman of the New Hampshire Fisher Cats (Blue Jays Double-A affiliate) led the league with a .438 average, nine home runs, 28 RBIs, 29 runs, a .480 OBP and a .768 slugging percentage in the month of May. Guerrero tied a Fisher Cats single-month record with nine home runs, and set the team record for hits in a month with 49. He finished May just two RBIs shy of the Fisher Cats single-month record, set by Travis Snider with 30 in May of 2008. Ranked No. 1 among minor league prospects by Baseball America, Guerrero had hits in 26 of 29 May games, and multiple hits in 16 of those games. The first-place Fisher Cats went 19-12 last month, and lead the league with 5.2 runs per game and a .277 batting average in 2018. 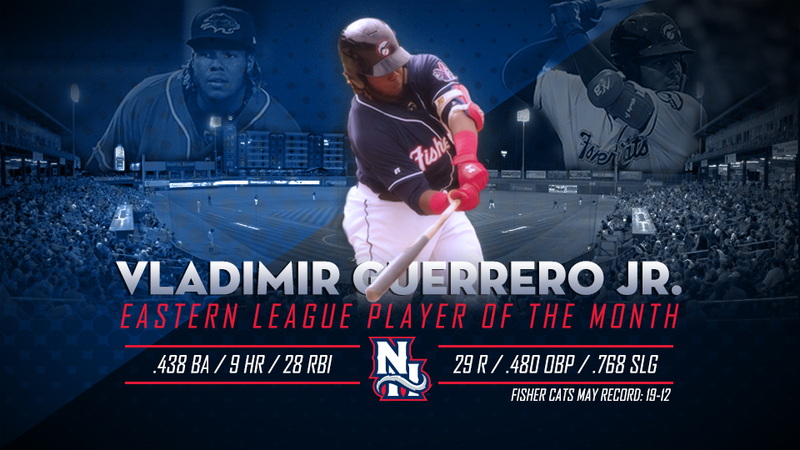 The 19-year-old Guerrero is the youngest player in Double-A and just the second Fisher Cat ever to win Eastern League Player of the Month (LHP Gustavo Chacin in 2004). Guerrero is also a two-time Eastern League Player of the Week (April 5 - 15 and April 30 - May 6). He has reached base in all but two of his 51 games this season, including a 37-game on base streak from April 18 - May 29, and leads the league with a .409 average. Guerrero's May highlights include two four-hit games, a two-homer performance with a blast off the Hilton Garden Inn on May 7, a walk-off home run on May 20, and back-to-back homers with fellow prospect Bo Bichette on May 25. Along with Bichette and Cavan Biggio, Guerrero's exploits have been featured on NESN, Boston.com, MLB Network, Sports Illustrated, ESPN, USA Today, MLB.com NPR and The New York Times. Guerrero and the first-place Fisher Cats (33-19) return to Northeast Delta Dental Stadium to start a six-game homestand on Tuesday against the Akron Rubberducks (Cleveland Indians) and Bowie Baysox (Baltimore Orioles). Homestand highlights include a Fisher Cats House Banner Giveaway on Thursday thanks to Northeast Delta Dental, postgame Atlas fireworks on Friday for Manchester Community College Night, The Sandlot 25th Anniversary Celebration with Beach Boys Atlas Fireworks thanks to TESTSTRIPZ.com on Saturday, and Kids Run the Bases on Sunday with a Vlad, Bo and Biggio Poster Giveaway from Spectrum Marketing.